The bank robbery that just occurred in Cyprus is not about the money. Sounds strange to say I know, but the Elite don't need more cash, they don't want more cash, why would they, it soon won't be worth the paper it is manufactured on? No, we have to think bigger. So why steal it? I agree it is a beta test. The test isn't just about how we react, but perhaps a warning to the rest of the world what is coming and who is in charge. The Elite want a new system. A one world economic system. A one world government must have one economy and as such the current world economies, must be "fundamentally transformed, to borrow a U.S. theme. Like always, they create the problem so they can bring their solution. All power in the world controlled by a few, and ultimately I believe, by one single person. Things are moving quickly, and according to plan. - W.E. Cyprus is a beta test. 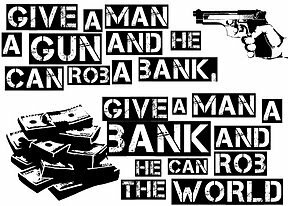 The banksters are trying to commit bank robbery in broad daylight, and they are eager to see if the rest of the world will let them get away with it. Cyprus was probably chosen because it is very small (therefore nobody will care too much about it) and because there is a lot of foreign (i.e. Russian) money parked there. The IMF and the EU could have easily bailed out Cyprus without any trouble whatsoever, but they purposely decided not to do that. Instead, they decided that this would be a great time to test the idea of a "wealth tax". The government of Cyprus was given two options by the IMF and the EU - either they could confiscate money from private bank accounts or they could leave the eurozone. Apparently this was presented as a "take it or leave it" proposition, and many are using the world "blackmail" to describe what has happened. Sadly, this decision is going to set a very ominous precedent for the future and it is going to have ripple effects far beyond Cyprus. After the banksters steal money from bank accounts in Cyprus they will start doing it everywhere. If this "bank robbery" goes well, it will only be a matter of time before depositors in nations such as Greece, Italy, Spain and Portugal are asked to take "haircuts" as well. And what will happen one day when the U.S. financial system collapses? Will U.S. bank accounts also be hit with a "one time" wealth tax? That is very frightening to think about. Cyprus is a very small nation, so it is not the amount of money involved that is such a big deal. Rather, the reason why this is all so troubling is that this "wealth tax" is shattering confidence in the European banking system. Never before have the banksters come directly after bank accounts. If everything goes according to plan, every bank account in Cyprus will be hit with a "one time fee" this week. Accounts with less than 100,000 euros will be hit with a 6.75% tax, and accounts with more than 100,000 euros will be hit with a 9.9% tax. How would you feel if something like this happened where you live? How would you feel if the banksters suddenly demanded that you hand over 10 percent of all the money that you had in the bank? And why would anyone want to still put money into the bank in nations such as Greece, Italy, Spain or Portugal after all of this? One writer for Forbes has called this "probably the single most inexplicably irresponsible decision in banking supervision in the advanced world since the 1930s." And I would agree with that statement. I certainly did not expect to see anything like this in Europe. This is going to cause people to pull money out of banks all over the continent. If I was living in Europe (and especially if I was living in one of the more financially-troubled countries) that is exactly what I would be doing. The bank runs that we witnessed in Cyprus over the weekend may just be a preview of what is coming. When this "wealth tax" was announced, it triggered a run on the ATMs and many of them ran out of cash very rapidly. A bank holiday was declared for Monday, and all electronic transfers of money were banned. Needless to say, the people of Cyprus were not too pleased about all of this. In fact, one very angry man actually parked his bulldozer outside of one bank branch and threatened to physically bulldoze his way inside. But this robbery by the banksters has not been completed yet. First, the Cypriot Parliament must approve the new law authorizing this wealth confiscation on Monday. If it is approved, then the actually wealth confiscation will take place on Tuesday morning. President Nicos Anastasiades, elected three weeks ago with a pledge to negotiate a swift bailout, said refusal to agree to terms would have led to the collapse of the two largest banks. "On Tuesday ... We would either choose the catastrophic scenario of disorderly bankruptcy or the scenario of a painful but controlled management of the crisis," Anastasiades said in written statement. In several statements since his election, he had previously categorically ruled out a deposit haircut. "I'm furious," said Chris Drake, a former Middle East correspondent for the BBC who lives in Cyprus. "There were plenty of opportunities to take our money out; we didn't because we were promised it was a red line which would not be crossed." As the President of Cyprus proclaims to his people that "we' should all take responsibility as his historic decision will "lead to the permanent rescue of the economy," it appears that the settled-upon 9.9% haircut is a 'good deal' compared to the stunning 40% of total deposits that Germany's FinMin Schaeuble and the IMF demanded. How would you feel if you woke up someday and 40% of all your money had been taken out of your bank accounts? At this point, there is still some doubt about whether this plan will actually be adopted or not. Right now the new president of Cyprus does not have the votes that he needs, but you can be sure that there is some high level arm twisting going on. Originally the vote was supposed to happen on Sunday, but it was delayed until Monday to allow for some extra "persuading" to be done. And of course the people of Cyprus are overwhelmingly against this wealth tax. In fact, one poll found that 71 percent of the entire population of Cyprus wants this plan to be voted down. The funny thing is that Cyprus is not even in that bad of shape. The unemployment rate is around 12 percent, but in other European nations such as Greece and Spain the unemployment rate is more than double that. Cyprus has a debt to GDP ratio of about 87 percent, but the United States has a debt to GDP ratio of well over 100 percent. So if they will go directly after bank accounts in Cyprus, what will stop them from going after bank accounts in larger nations when the time comes? In the final analysis, this is a game changer. No longer will any bank account in the western world be considered to be 100 percent safe. Trust is a funny thing. It takes a long time to build, but it can be destroyed in a single moment. Trust in European banks has now been severely damaged, and that damage is not going to be undone any time soon. This is a breach of fundamental property rights, dictated to a small country by foreign powers and it must make every bank depositor in Europe shiver. Although the representatives at the bailout press conference tried to present this as a one-off, they were not willing to rule out similar measures elsewhere - not that it would have mattered much as the trust is gone anyway. It is now difficult to expect any kind of limitation to what measures the Troika and EU might take when the crisis really starts to bite. if you can do this once, you can do it again. if you can confiscate 10 percent of a bank customer's money, you can confiscate 25, 50 or even 100 percent. I now believe we will see worse as the panic increases, with politicians desperately trying to keep the EUR alive. Depositors in other prospective bailout countries must be running scared - is it safe to keep money in an Italian, Spanish or Greek bank any more? I dont know, must be the answer. Is it prudent to take the risk? You decide. I fear this will lead to massive capital outflows from weak Eurozone countries, just about the last thing they need right now. This is the biggest moment that we have witnessed since the beginning of the European financial crisis. Jeroen Dijsselbloem, president of the group of euro-area ministers, on Saturday declined to rule out taxes on depositors in countries beyond Cyprus, although he said such a measure was not currently being considered. Such a measure is "not currently being considered" for other members of the eurozone? Yeah, that sure is going to make people feel a lot more confident in what is coming next. I have insisted over and over that the next wave of the economic collapse would originate in Europe, and we may have just witnessed the decision that will cause the dominoes to start to fall. The banksters have sent a very clear message. When the chips are down, they are going to come after YOUR money.